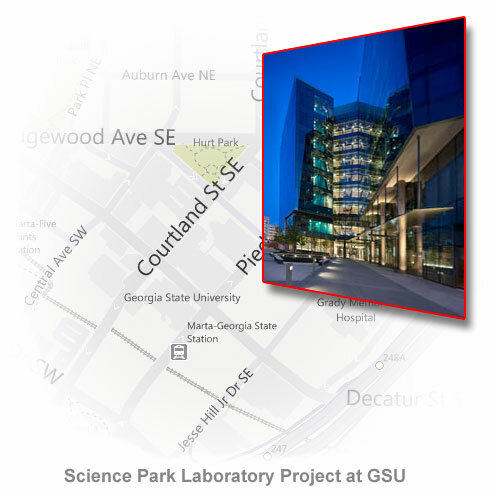 Caldwell Insulation, Inc., the southeast leading laboratory insulation contractor, announces the completion of the new Parker H. Petit Science Center at Georgia State University (GSU) in Atlanta. The 350,000-square-foot building, totaling nearly $2 million in cost for the mechanical and plumbing insulation systems, is intended to bring research, educational and economic opportunities to Atlanta. The new science center will provide science teaching and research labs for the College of Arts and Sciences and the College of Health and Human Sciences. The center will also be home to Georgia State’s research and education programs in biology, chemistry, nursing, nutrition, physical and respiratory therapies, as well as the Neuroscience Institute and the Institute of Public Health. Features inside the building include state-of-the-art dry and wet laboratories, BSL-2 and BSL-3 labs, and a BSL-4 suite. Working on a state-of-the-art laboratory facility in the heart of downtown Atlanta presented an array of challenges that Caldwell had to plan for and then manage. Tight schedules, complex piping and ductwork systems, and the challenge of logistically working in the middle of a downtown university were just some of the obstacles that Caldwell worked to overcome. Our most proud moment was seeing it thru to the end while working some 30,000 man hours with no injuries.